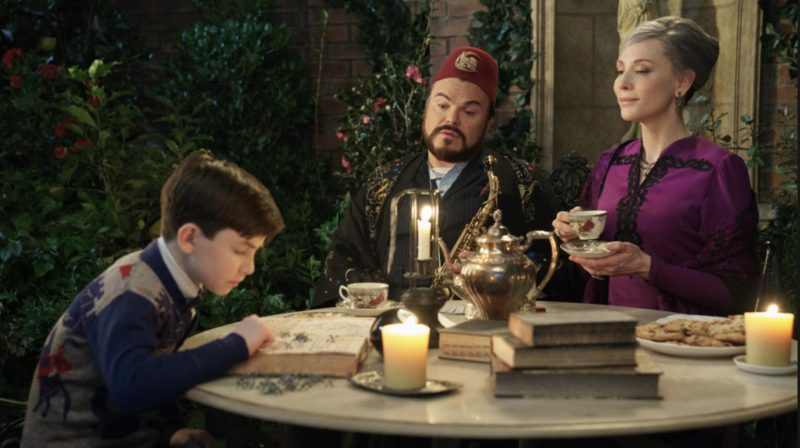 Formulaic: Lewis (Owen Vaccaro), Uncle Jonathan (Jack Black) and Mrs Zimmerman (Cate Blanchett) in The House with a Clock in its Walls. A RETURN of the old kid horror formula, The House with a Clock in Its Walls pitches well to its target audience but fails to reach the heights it sets out to achieve. Based on the book by writer John Bellairs and illustrator Edward Gorey, we find a shy Lewis Barnaveldt (Owen Vaccaro) making his way to New Zebedee after the sudden death of both his parents. The only family left is estranged Uncle Jonathan (Jack Black), an odd character who lives in a rather creepy looking mansion. The mansion is furnished a multitude of clocks, some real vintage items and a purple-dressed Mrs Zimmerman (Acamedy Award winner, Cate Blanchett). It is slowly revealed to Lewis that the house, which he now calls home, is alive with a little magic but this doesn’t deter the miserable kid who jumps at the opportunity of becoming a warlock himself, especially seeing he’s still finding hard to find his way in his new school. In the quest to impress his new friend, Tarby (Sunny Suljic), Lewis breaks the only rule set by his uncle and unravels a dark magic that is forbidden, leaving him, his uncle, Mrs Zimmerman and the world in great danger! Horror filmmaker Eli Roth (Grindhouse, Hostel) does well in providing some genuine jump scares throughout (even for the adults in the room) and a lot of creepy elements to add to the film’s setting. Accompanied with the combination of Jack Black (Uncle Jonathan) and Cate Blanchett (Mrs.Zimmerman) who boast such sheer talent onscreen, the film’s potential was quite high. This is marred by the dry comedy that sometimes too dry and too easily missed. It was the comedy that probably could have carried it all the way through once all the surprises are unveiled. Instead we get an overcooked third act with a bad guy dismantled at the click of a finger (not literally). Furthermore, there is a lack of value in our main character’s school life, which barely enhances the plot other than his friendship with nice guy-turned bully, Tarby. The inclusion of the little Asian girl who kept propping up throughout also a tad wasteful as her appearances may lead audiences to expect her to source a major twist. The House with a Clock in Its Walls still holds enough entertainment for the young tykes and the narrative holds true throughout, just don’t expect the same for those bringing the kiddies along!